Competition for top-flight nurses in today’s market is tight. As a healthcare recruiter, you need to realize high-quality candidates consider more than wages or salary when choosing which organization to join. Learn about five of the most important culture and engagement factors nurses weigh when deciding between potential employers, and integrate them into your nurse recruitment strategies. For Bellingham, Wash.-based Eunice Tomberlin, RN, CEN, “The most important factor in choosing to work for a certain hospital is departmental reputation.” Are patient outcomes good? 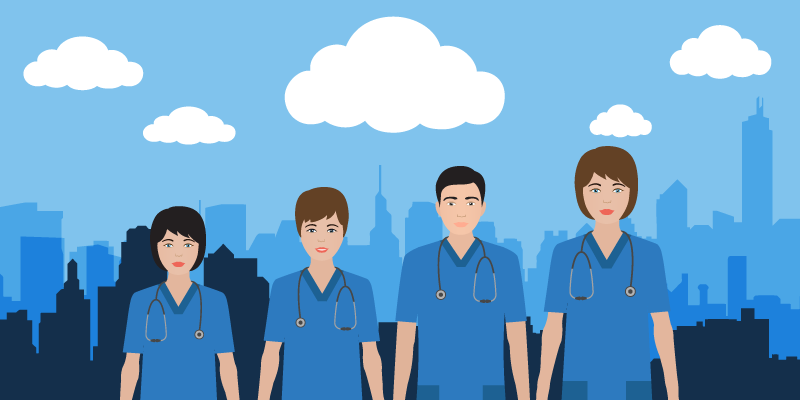 Are team members patient-focused, competent and collaborative? What “bests” does the organization have? Take Action: When hiring for a particular specialty or department, highlight awards and other accolades that validate quality. Be on the lookout for local workplace awards and enter to win them to affirm what a great place your organization is to work. Share patient stories on your career site and in communications to potential employees to provide anecdotal proof of the impact your nurses have on care. Take Action: Create day-in-the-life videos with current employees talking about collaboration and teamwork. Bring a collaborative approach to interviewing and involve peers in the process. This will indicate to candidates that coworkers’ opinions matter to the organization. Take Action: Include details on your organization’s scheduling options and models in the interview process. This will also help with retention because candidates will have a better idea of what they are signing up for when they decide to join the team. “Training and advancement are important, because they show investment in the workforce and planning for the future,” Angelis says. It also lets employees know that they can grow within the organization rather than having to leave to gain more skills and advance. Take Action: Showcase opportunities for learning and advancement, particularly any tuition assistance or reimbursements for certifications and nursing conferences. Be sure to note how certification and master’s degrees impact wages and salaries. More and more, nurses are concerned about their safety at work, whether the concern stems from workplace bullying, challenging patients and family members, or other situations. Tomberlin says nurses want to work at facilities that make them feel like their personal safety is paramount. Take Action: Outline your organization’s security infrastructure and procedures to help keep employees safe — including secure entries, guidelines for when police support will be called, and even anti-bullying policies. Workers can’t be happy and productive unless they feel safe. As you work to fill your nurse vacancies, consider how you could use integrate these key factors into your nurse recruitment strategies. After all, in today’s market, you need to set yourself apart from the other healthcare organizations as an employer of choice. This entry was posted in Uncategorized on March 5, 2018 by ZFR.